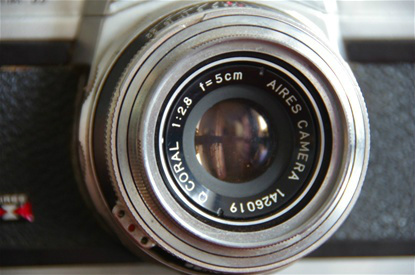 Aires Camera Works started producing some Twin Lens Reflexes in 1949, then 35 mm rangefinders from 1954. It was a small and not very strong company. 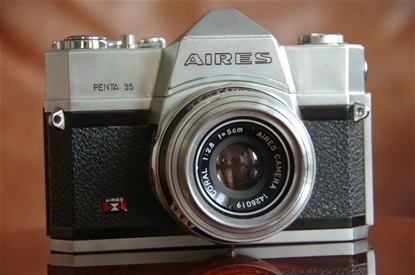 As the PP SLR wave came rolling, Aires debuted in 1959 with the Penta 35, called Reflex 35 in some markets. 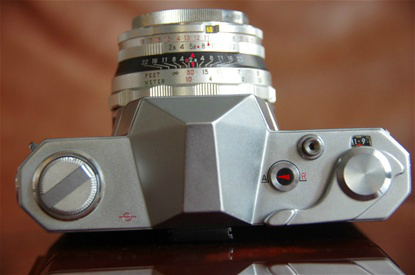 It was a fixed lens camera with a central leaf shutter, thus following the fading west german brands of Contaflex, Kodak Retina and Voigtländer Bessamatic and the not so successful Kowa of Japan. The camera was followed up by a metered version in 1960, but the company went out of business in July the same year. Production wise a life span as long as the Zunow, but not leaving the same traces..
A fixed lens, Q Coral 50/2,8 with leaf shutter. Sn. 1426019. A firm short stroke winder to the right, then shutter release button and shutter lock A/R. To the left a foldable rewind crank. Clean layout as the shutter time was set on the front of the lens, ranging from B to 1/500 second. Flash socket at the left side, over the back door closing mechanism.